These three pieces, dedicated to Eleftheria Kotzia, are in the form of a suite and are based on three melodies by two Greek composers Mikis Theodorakis and Nikos Antypas. 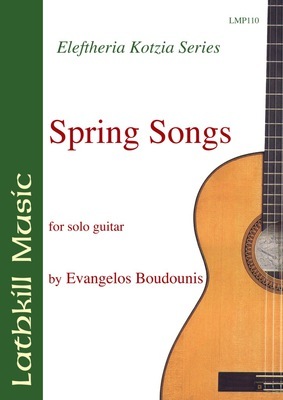 "Melodies by Mikis Theodorakis and Nikos Antypas are used here to produce a set of three pieces in a very accessible style requiring an upper grades technique. All three pieces share a similar episodic tendency, which may come from their origin as cadenzas in vocal settings of the songs. Tempo and meter change repeatedly and a fairly determined rhythmical drive would be required to keep them hanging together. Given such drive I am sure they would produce a very good effect. The last piece features some percussion on the instrument and an alternative ending should the player feel they want to share their singing as well as their playing." - Classical Guitar Magazine. "Une musique originale par sa melodie et par sa structure, qui malgre sa difficulte technique devrait interesser de nombreux guitaristes. - Guitare Classique.